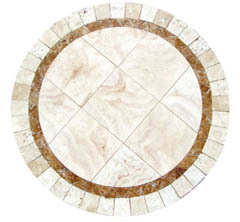 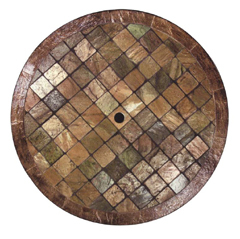 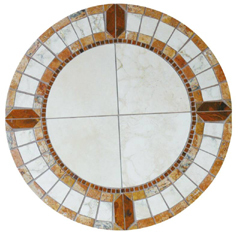 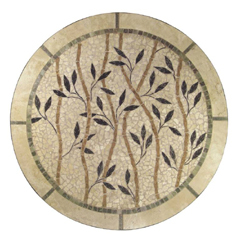 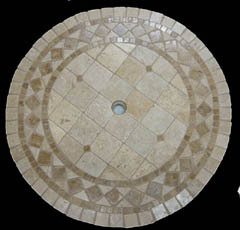 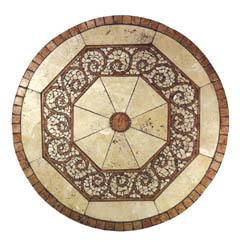 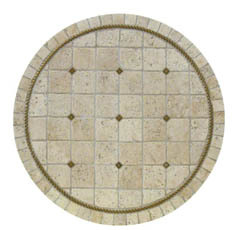 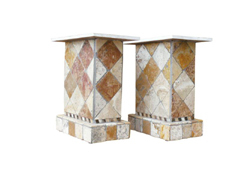 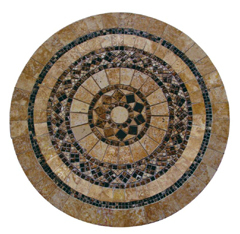 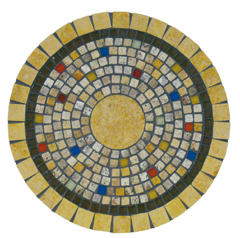 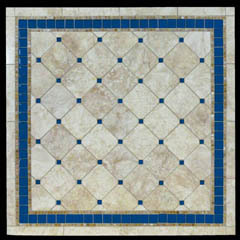 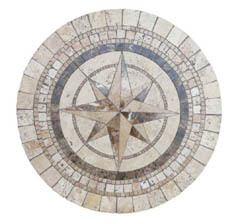 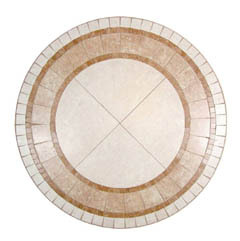 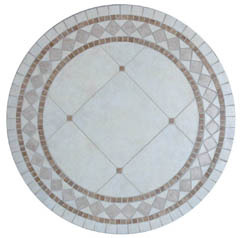 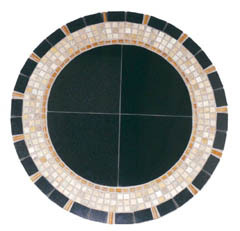 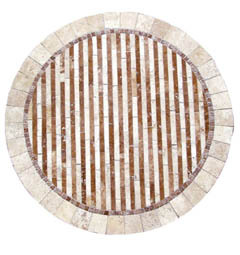 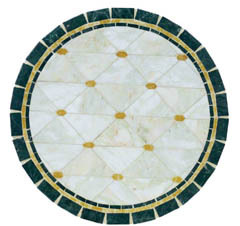 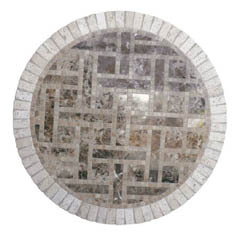 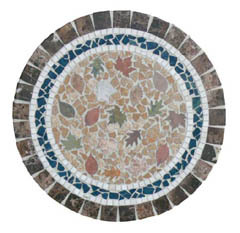 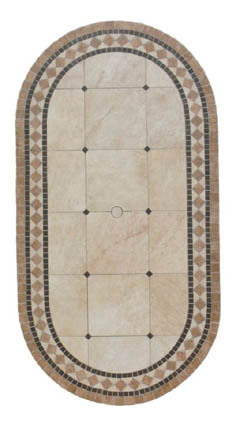 Below you will see our entire collection of natural stone, mosaic kitchen table top designs. 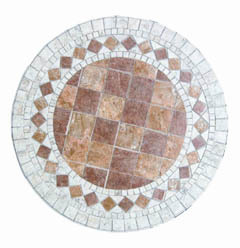 While the pictures shown may be round, square, or otherwise, it is important to note that each and every design can be crafted into any shape you like. 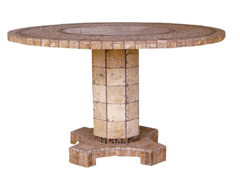 If you are intrigued by one of our designs, simply imagine it in the size and shaped square that you want, and let our team of American based designers and craftsmen customize a table that will meet your exact specifications. 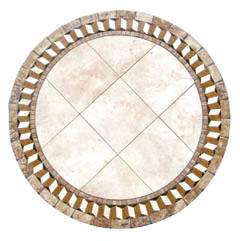 An attractive design, this table features a soft, off white, natural stone, broken periodically by tiny blue accents, which serve to create a quietly mesmerizing effect across the surface of this kitchen table top. 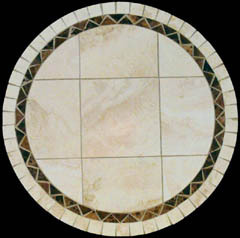 Crafted into custom sizes and shapes based on your specific preferences. 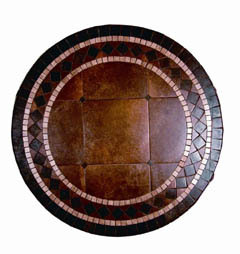 This kitchen table top design is a powerful expression of human art, recreating natural beauty. 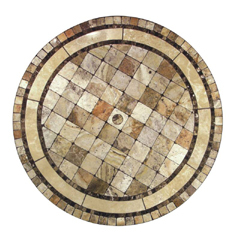 The stones flow down the middle of the piece like a stream, passing between to matched shores of natural multicolored splendor, creating a piece which is truly impressive in its rustic, rugged perfection. 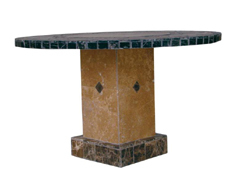 Each of our tables is crafted from thin pieces of natural stone adhered to a light weight space age core that makes our designs some of the lightest and most mobile on the market. 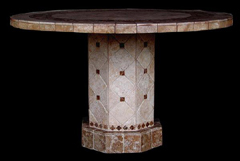 Our tables all also come with the option of being crafted into the size and shape you choose. 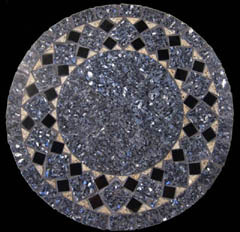 You can customize these pieces even further by adding a functional umbrella hole, or an attractive, decorative onyx ring, which will illuminate the night with a softly glowing beauty. 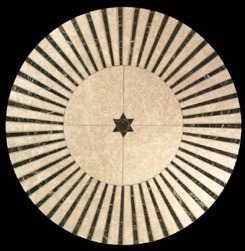 Blue pinwheel spikes strike out across a cloud washed white gray backdrop, radiating as one from the simple starry emblem centerpiece situated in the midst of the great display. 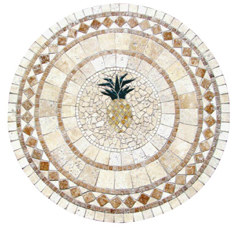 A simple design, composed of hundreds of tiny chips of natural stone, crafted with an eye towards classic styles, its an expression of elegance which is as timeless as the art that crafted it. 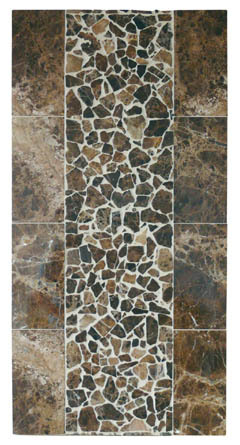 Waterproof for indoor or outdoor use. 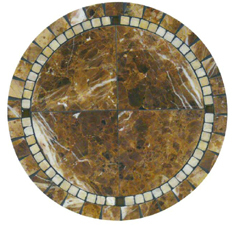 A patchwork medley of gold and gray, tan and whites all contrasting to create a shimmering surface of natural stone, which evokes a sense of stately elegance which is derived from its mountainous heritage. 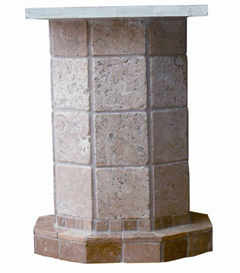 Available with optional umbrella hole and illuminated onyx ring.